YOURS PRODUCTLY – What’s a PERT chart? The Program (or Project) Evaluation and Review Technique, commonly abbreviated PERT, is a statistical tool, used in project management, that is designed to analyze and represent the tasks involved in completing a given project. First developed by the United States Navy in the 1950s, it is commonly used in conjunction with the critical path method (CPM). PERT is a method to analyze the involved tasks in completing a given project, especially the time needed to complete each task, and to identify the minimum time needed to complete the total project. 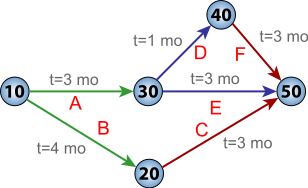 PERT network chart for a seven-month project with five milestones (10 through 50) and six activities (A through F). So, where do you find a good product manager? What is Cohort Analysis and why it is important?